The Earned Value Management (EVM) is a project controlling technique that objectively tracks the physical accomplishment of work and predicts the future performance of the project. EVM is used to measure the progress and to assess the status of a project in order to enable timely, effective management decisions. EVM integrates technical scope with schedule and cost objectives during the execution of the project. EVM provides not only the past and the current performance of a project but also forecasts its likely future performance. A positive CV indicates a favorable condition: the project is under-budget. A negative CV indicates an unfavorable condition: the project is over-budget. A positive SV indicates a favorable condition: we are ahead of schedule. A negative SV indicates an unfavorable condition: we are behind of schedule. An SPI of 1.0 means the work is being performed right to the schedule. (on schedule). An SPI above 1.0 means that the work is ahead of schedule. Efficiency is realized. An SPI below 1.0 means that the work is behind schedule. Efficiency is low. The BAC is generally plotted over time, for example, periods of reporting (monthly, weekly, etc.). So that means the budgets for all authorized work must be captured within the BAC. The BAC is used to compute the Estimate at Completion (EAC) and explained in the next section. The Estimate at Completion (EAC) is an independent forecast of the total cost at the completion of the project. So it is used to predict future cost performance for all authorized work. This method assumes what the project has experienced to date can be expected to continue in the future. So the overall budget is scaled in proportion to the cost performance to date. (BAC divided by CPI). This is a realistic method, which is appreciated by many experts in project management. If there has been no change in the project, this is mathematical, identical to the formula above. However, if the project has been rebaselined, this formula is more useful. This tends to be the lowest likely cost outcome if the project is over budget (Low-End Cumulative CPI EAC). The total estimate is the actual cost to date plus the remaining budget (BAC - EV). This method is used early in every project to avoid major fluctuations. In this case, the variances at the current stage are typical (through to around the 15% to 20% stage) and are not expected to occur in the future in any circumstances. The total estimate is the actual cost to date plus the remaining budget scaled in proportion to the cost performance to date, adjusted by SPI. This method is most useful when the schedule performance has an impact on cost performance. This tends to be the highest likely cost outcome if the project is over budget and over time (High-End Cumulative CPI × SPI EAC). In VNCproject, the EAC is calculated with the first formula. Variance at completion (VAC) is the variance on the total budget at the end of the project. This is the difference between what the project was originally expected baseline to cost versus what it is now expected to cost. 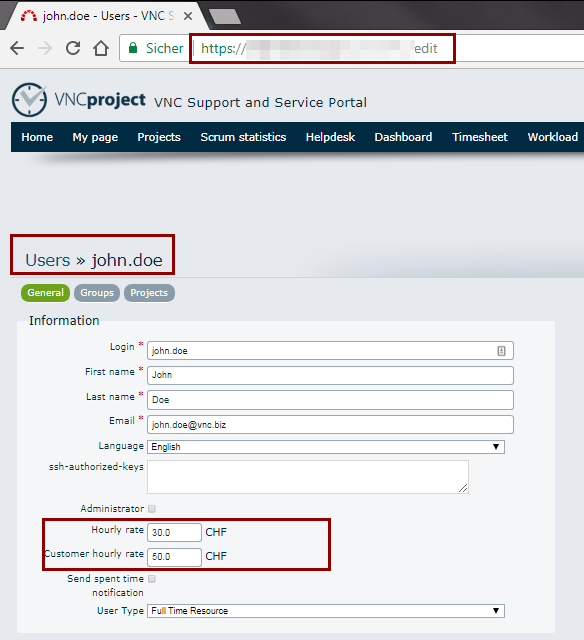 In VNCproject/Admin/Users, we can define two kinds of hourly rates for an employee: the “basis hourly rate” is used for the internal projects and the “customer hourly rate” is used for all projects with project type “Customer Project”. The user John Doe is set to a basis hourly rate of 30 CHF and a customer hourly rate of 50 CHF. We have the option to set initial hourly rate for via first history item containing hourly rate change. This rate will be used for the time logs created before we have set the hourly rate for the user. This option is also available for “Customer hourly rate”. In the same example, we see that the customer hourly rate was changed from 30 CHF to 50 CHF. But we can find the old initial hourly rate if we click the “edit pencil icon”. Important: If there is no history item for any rate, then current profile rate is used for time logged. The contract value is the contractually agreed price, which was signed with the customer or the planned value for the internal project, can be added by the project manager. 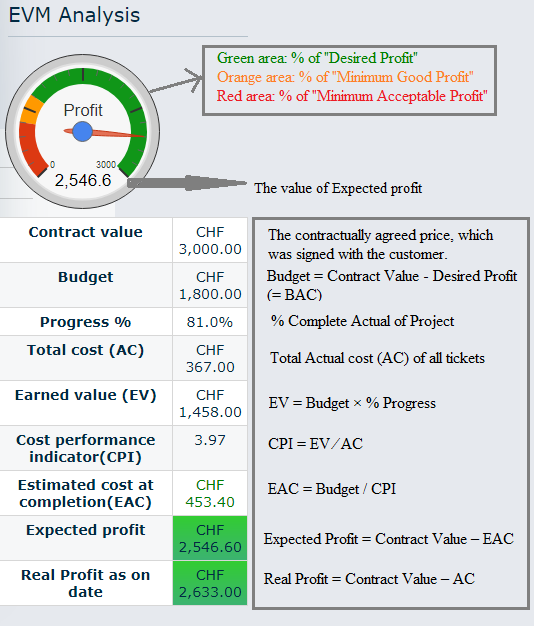 The contract values in VNCproject are set to CHF in our example. Three percentage profit values are defined at project level: “Desired Profit”, “Minimum Good Profit” and “Minimum Acceptable Profit”. The rate multiplier for customers = 3. If one of the employees' rate is 10 CHF per hour, then the external EVM calculations for this employee will be 30 CHF, and all EVM customer calculations will be based on this external rate. In some projects, there are different contract values per period. So a tab named “Contract values” is added on the project settings page. We can define multiple contract values there. There are 3 mandatory fields: contract value, start date, and end date. For each contract value, tickets created between these dates will be considered. On project overview, the sum of all contract values will be considered as project contract value. 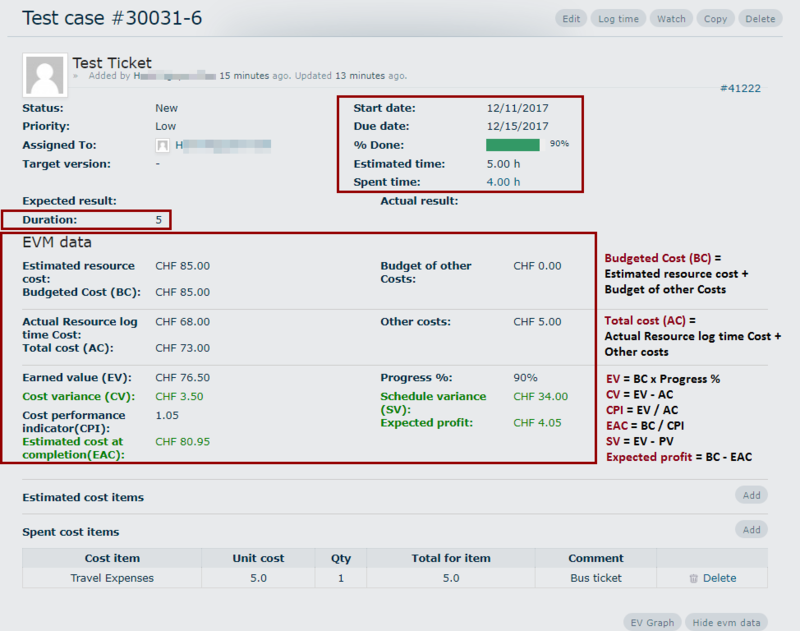 We can see the EVM data for a particular contract value period on EVM Report tab. The percentage profit values are defined at the project level and will be used for each contract value per period. Start date must be greater than previous contract's End date. Any updating/creation/deletion of contract values will update the project contract value. There are two more columns in contract's setting: Ones is “Description”, in which the manager can add more details about each contract. The “Date” column will show the created date and time of each contract and its last update. Besides the multiple contracts, we can create also the purchase orders for each version. So a tab named “Purchase Orders” (2) is added on the project settings page (1). If we click the button “New purchase order” (3), a new window will be opened. We can add all the order's details such as Issue's number, version's name, order's number, amount, date, description. In the mandatory field “PDF file”, we can add any files, which relate to the order in PDF format. Then this “traveling expenses” will be displayed in the "Other Costs" at the issue’s page. 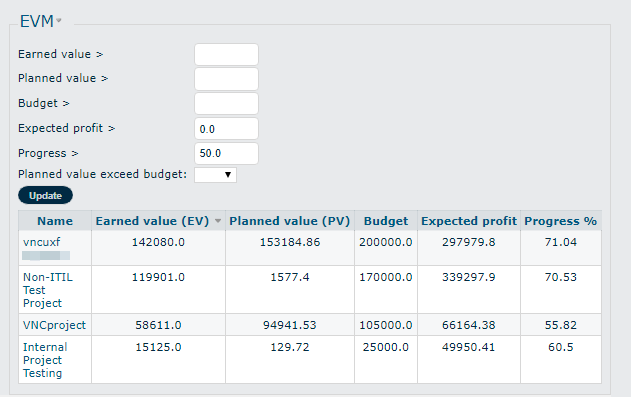 The values of “Estimated cost items” after defining will be displayed in “Budget of other Costs”. 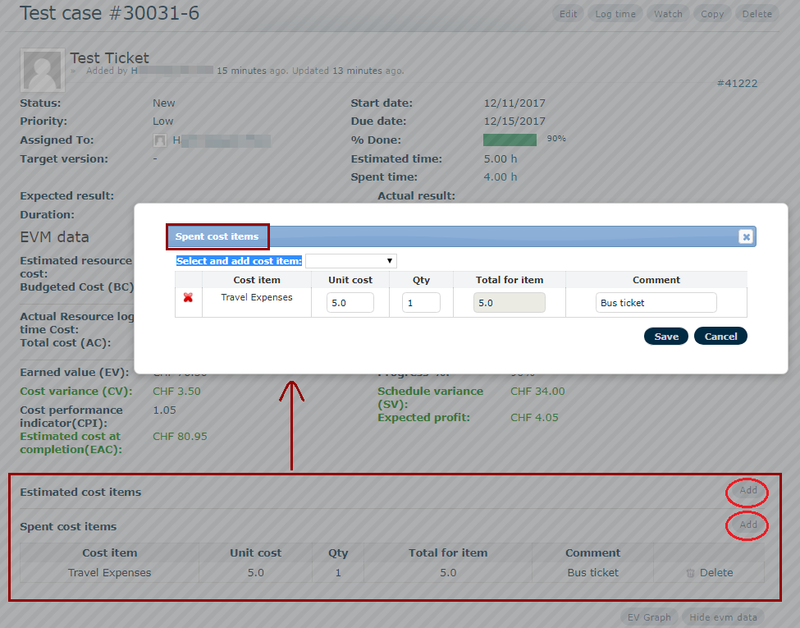 Calculation of "Planned Value" (PV) in ticket level: Planned value is the budget planned until today and it bases on the setting the start date, due date, duration (between the start date and due date) and the estimated cost per day or the BC. The progress (% Done) will be calculated on multiple levels of the project with the bottom-up principle: from every single task (the lowest level) to the tickets level, versions level and finally to the project's level. Other EVM formulas to calculate the BC, AC, EV, CV, CPI, EAC, SV and “Expected profit” in ticket level will be shown in the picture below. 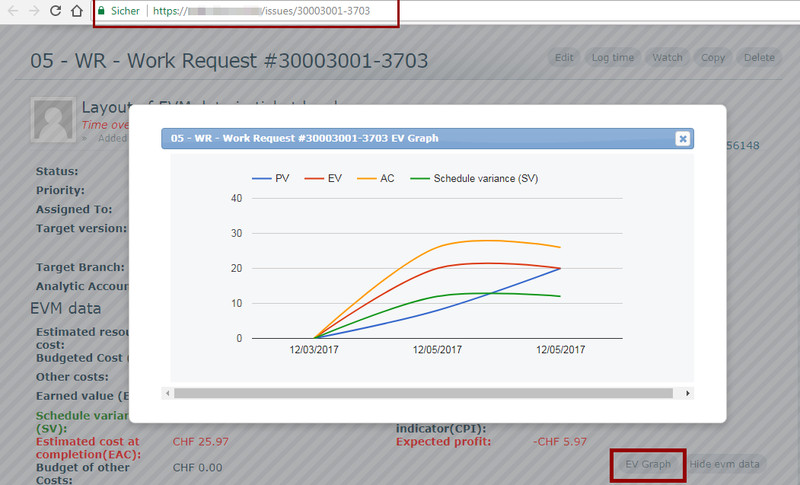 PV = Number of days since reported × Estimated cost per day = 2.5 x 17 = 42.5 CHF. We can click the button “EV Graph” on the right bottom to see the EV Graph of the ticket. If the red line of EV is above the blue line of PV or above the orange line of AC, the ticket’s cost is under the budget and ahead of schedule. If the red line of EV is under the blue line or under the orange line, the ticket’s cost is over the budget and behind of schedule. In the case, the red line of EV is identical to the blue line of PV or the orange line of AC, the ticket’s cost is on the budget and on schedule. The green line in this graph will show the schedule variance (SV). If this line is above/under the x-axis (0-line), the ticket’s cost is ahead/behind of schedule. 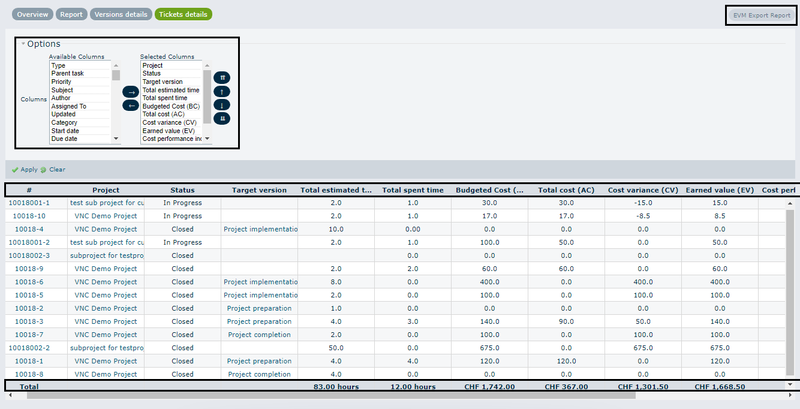 There is a quick performance on the project overview page to show the important values of EVM. The people who have access to EVM can see how the project is doing on the main page of the project. Before checking the EVM values on the main page, we need to calculate EVM data to see the actual result. Without “Calculate EVM data” the system computes EVM data automatically at 5 AM every day. 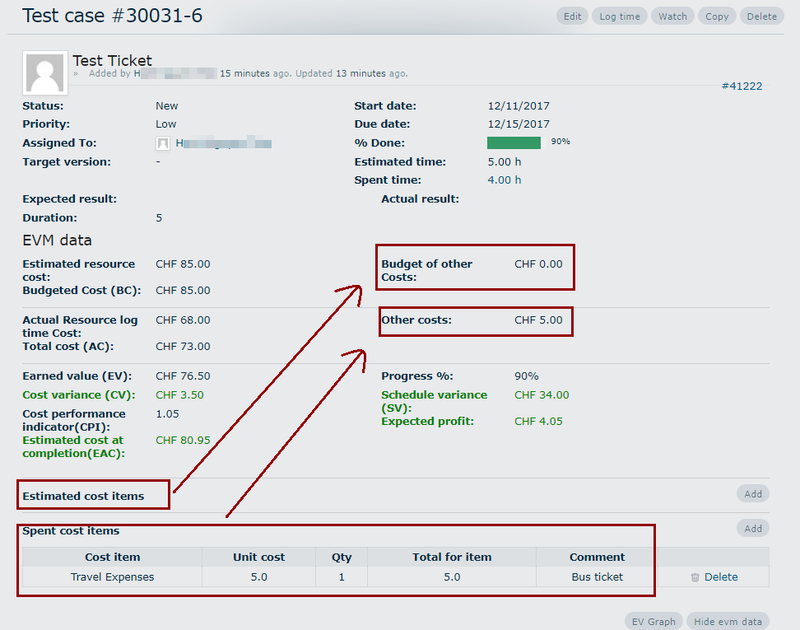 There are 3 different quick performances on the main page: an EVM Bar Chart on the left side of the page, an EVM Graph in the middle and a quick EVM sidebar on the right site with a “profit scale. EVM sidebar:The total EVM calculation for the project’s level on a certain date will be shown in the picture below. EVM Graph: This “EVM Graph” at the project’s main page shows the same 3 basic factors as the “EVM Graph” at the issue’s page. The difference is, the budget (BC), EV and AC in this graph is the values of the project’s level from the beginning until the computed date. A positive result will be realized, if the red line of EV is above the blue line of BC or the orange line of AC (under the budget and ahead of the schedule). If not then the project has a negative result (over the budget and behind the schedule). EVM Bar Chart:The total BC, EV, and AC of the project as on date will be shown at “EVM Bar Chart”. If the “% Progress” of the project reaches 100 %, the total EV will be equal to the BC. The full EVM Report will be shown at “EVM Report” tab. There are 4 tabs inside this tab: Overview, Report, Versions details and Tickets details. 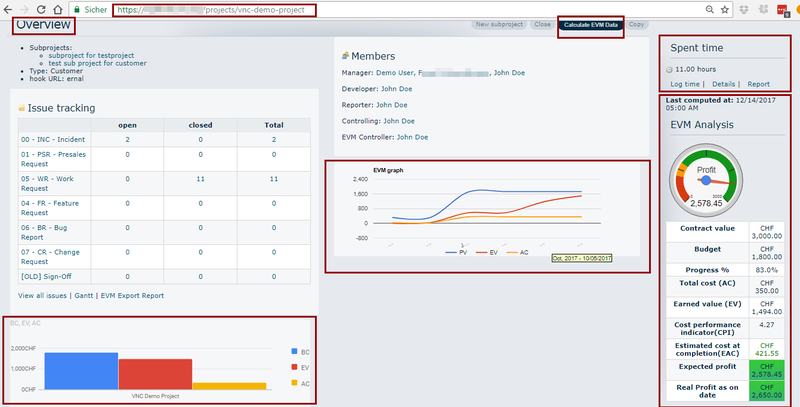 In this tab, we can see the EVM values at project’s level and it’s “Bar Chart”. For example, we choose the contract at the period from 01.04.2017 to 30.06.2017, all the EVM values and the bar chart will be filtered and changed within the respective contract’s period. Please note: The filtered contract’s period has only 2 tabs to display, the “Overview” and the “Tickets details”. In this tab, we can see and compare the EVM values monthly. We can see again the “EVM Graph” with 3 factors PV, AC, and EV. If we click in some places in the line, the value of the month will be displayed. 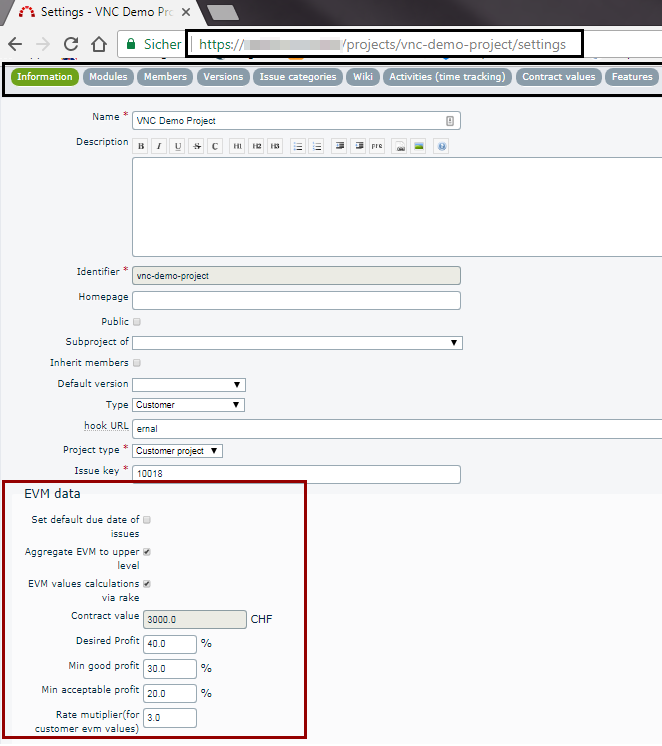 In this tab, all the version details and non-version details with the total values of each EVM factor will be displayed. In the example below, there are 2 versions without total cost values. The CPI is 0 and the EAC will not be identified. We can also compare the “contract value” of each version (according to the purchase order) and the actual budget of each version (based on the project's budget). The value of non-version is zero. The last tab in the EVM Report is the “Tickets Details” tab. In this tab, all tickets will be displayed in details. To see the details easier, we can use the “Options” function to select any respective column. The last row in the table is the total values of all tickets. At any point in time, we can download a full detailed report of the EVM data, if we click the “EVM export report” on the top-right of the screen. EVM sheet will include all the values of EVM related to the project. This following values of EVM should appear also in the overview all projects: Budget (BAC), Progress %, Total cost (AC), Earned value (EV), Cost variance (CV), Schedule Variance (SV), Estimated cost at completion (EAC) and Expected Profit. 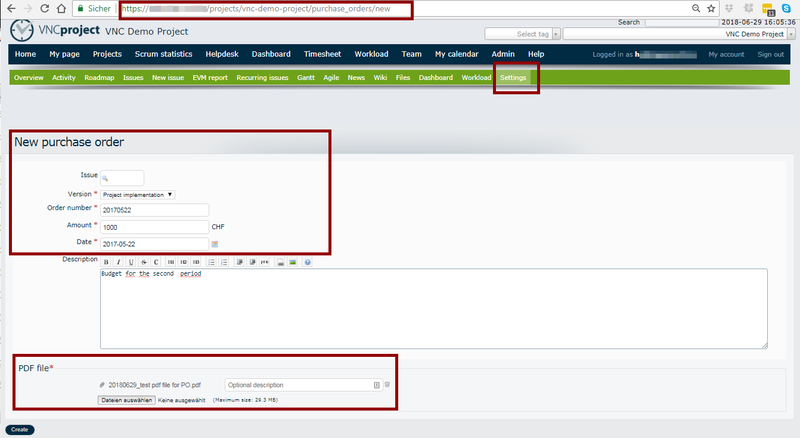 With “Filters” and “Options” function we can select any kind of projects or any columns as required. We can choose the EVM with the specific value at the dashboard. All the projects, which are based on this filtered values will be shown. In the example below, all projects with their “Expected profit” greater than 0 and their “% Progress” greater than 50% are filtered.